Hey guys! My name is Sam and I’m the proud owner of this blog. I’ve been drinking coffee ever since I entered those sweet, sweet years of adolescence. Of course that was mostly some sort of iced coffee with an absurd flavor and as much sugar as my parents would allow me. As I’ve gotten older I’ve gotten more into coffee and have learned quite a latte. I would love to guide anyone who is interested in coffee through the world and maybe add onto the knowledge of those who, like me, are already passionate about this bean juice. 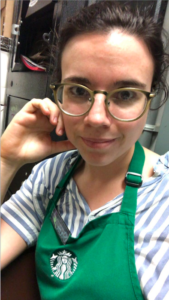 You may be wondering “who is this any little coffee freak and how does she have the knowledge to guide me through coffee?” Well I’m by no means an expert or professional. I’ve been working as a barista for about a year and have learned most of my coffee facts since I started. There are things that being a barista has shown me and there are many things out there to learn. Hopefully this blog will help you in your own exploration and give you a little more insight!